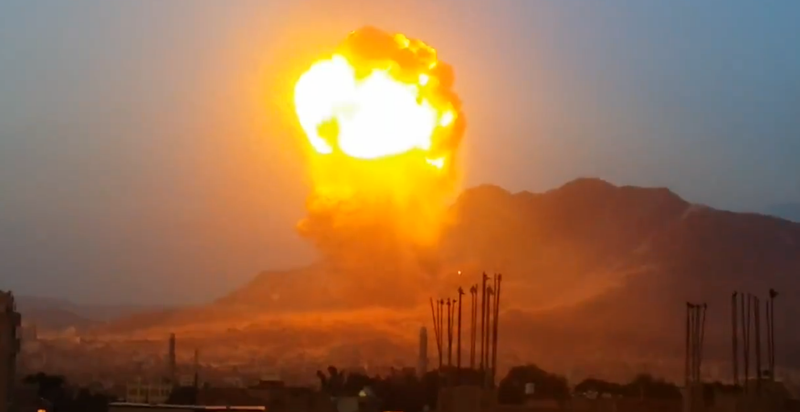 There have been some massive explosions caught on film during the last month of Saudi-led air strikes on Houthi rebel positions, but the result of this particular attack is so enormous you could be mistaken that it’s the kind of mushroom cloud and fallout seen during early tactical nuclear weapons tests. The fireball and resulting mushroom cloud seen in this video is not just from a weapon dropped by a fighter aircraft, but the result of explosive munitions and/or oils and fuels stored at the site ignited by the initial blast. These “secondary effects” combine to create some absolutely stunningly scary exothermic reactions, as seen above. I’ve received some mail asking how Houthi rebel forces are so heavily armed that explosions like these continue to happen. The answer is that Houthi forces now control the western half of Yemen, along with Yemen’s antiquated – although still deadly – military stockpiles, which included gravity bombs and SCUD missiles. Even if Houthi fighters aren’t able to use these systems for their intended purposes, they can be used for improvised explosive devices or they can fall into the hands of terrorist elements that riddle the country. With that in mind, the Sunni Arab dominated coalition has had these sites at the top of their target list. Seeing as Houthi fighters know full well the location of established Yemeni military weapons dumps and installation before seizing large areas of the country, many of the weapons themselves were squirreled away to other sites. We’ll continue to see these explosions happening as Saudi, pro-government Yemeni and allied intelligence sources locate them.